I must be getting the same press kits as Oliver at Soul-Sides, some PR outfit sent me the Roots of Chicha 2 aswell. But be sure to check out Soul-Sides Cumbia article, O-dub kind of nails it – with respect to the resurgence/popularity of the cumbia genre. The one I really liked the best was Ranil’s Jungle Party. Pretty awesome Amazonian Cumbia from the people at Light In The Attic Records – they were nice enough to let me download the whole album. Thanks guys! I’ll pretty much let them do the talking. I selected the song I liked the best from this really obscure artist. Highly recommended album. Enjoy! Deeply funky psychedelic-surf guitar jams from Ranil y Su Conjunto Tropical (Ranil and his Tropical Band). 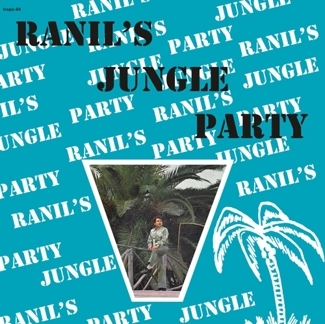 Ranil’s Jungle Party (re-released for the first time by folks at Masstropicas and limited to 1,000 copies) brings back from the past the much loved popular music of Peruvian cumbia. For the uninitiated, Peruvian (or Amazonian) cumbia was to Peru as Tropicália was to Brazil—a 1960s – 1970s popular music style that mixed (often irreverently) traditional music with those of African and the West. Hailing from the Belen district of Iquitos, nestled within the heart of the Amazonian rainforest, Ranil and Co. were definitely digging on some Western Surf music while keeping alive the traditional highland “huayño” dance music. On Ranil’s Jungle Party, Ranil and his Tropical Band keep things in a mellow, funky mood with some heavy psych-surf guitar workouts. The result is a style mash-up not unlike that of African “Juju” or “High-Life” music, popularized by the incendiary Stratocaster guitar playing of King Sunny Adé. In fact, think of Ranil’s Jungle Party as King Sunny Adé jamming with some Andes dudes while on vacation in Peru. Dig? Stand out tracks include “Marlenita” with its highly melodic guitar riff and frenetic percussion and “Chinito rulo” which grooves in an Eastern drone / psych fashion and the beautifully melodic electric 12-string of “Tus cabellos”. It’s largely an instrumental affair but Ranil steps up to the mic for “Denuncia a tu Pátron”, “El manicero” and “Carbonero”. Masstropicas worked with Ranil on this vinyl LP re-release (his records were originally produced and released by himself on his own label) and we look forward to more in the future. I bought this the week before last and like others songs on the LP a lot more. Not that this one is bad (at all), but just in case anyone is on the fence about picking up the LP I thought it was totally worth it. Lots of gems.